Solid furniture-grade beech hardwood cabinet of beautiful design and construction. latches and a black felt fabric interior that provides a stunning contrast for your cards. Cabinet comes ready to mount with installed wall hanging brackets (cards are not included). 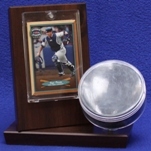 Dimensions:28"H X 16"W X 1.75"D Space between Shelves: 6.5"
case is the perfect solution for displaying 20 of your favorite sport / collector cards. wall hanging brackets (cards are not included). 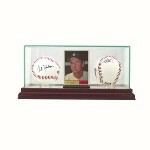 Includes 1 nameplate. a stunning contrast for your cards. Cabinet comes ready to mount (cards are not included). 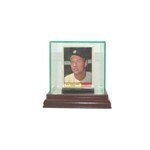 case is the perfect solution for displaying 36 of your favorite sport / collector cards.